A recent graduate of Gray’s School of Art has won a prize at a prestigious exhibition for a painting inspired by the autumnal forests of Deeside. 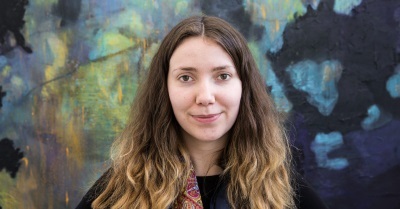 Aberdeen-based painter Julie-Ann Simpson (22), who graduated last year, was presented with the Guthrie Award by the Royal Scottish Academy (RSA) in Edinburgh as part of its Open Exhibition. The award, of a medal and £750, is presented for an outstanding painting by a Scottish artist under 35, with Julie-Ann’s work being selected from hundreds of exhibition pieces. She said: “My work takes influence from lots of sources, particularly nature, with my exhibition piece ‘Among Silver Birches’ inspired by the autumnal forests of Deeside. “I create abstract images which are ambiguous and suggestive; they could be ephemeral details of the landscape or broad panoramic views. I catalogue shape, texture and colour from nature and try to reassemble them on canvas – recreating a sensual experience. Julie-Ann, who has been working part-time to fund her painting since graduating and is planning some new exhibitions in the new year, added: “It has been quite challenging to try and find a job that fits my skill set as an artist in Aberdeen, but I am keen to stay within the city for the next couple of years – I think there is huge potential for cultural and creative development in the north east. This year’s RSA award selection committee comprised Professor Lennox Dunbar RSA; Arthur Watson PRSA, founder of Peacock Visual Arts; Dr Fiona Dean RSA and Professor Gareth Fisher RSA. For more information on Julie-Ann’s work, visit her Facebook, Tumblr or Twitter pages.